Home Tags Posts tagged with "calendar"
Why Video Games Are Key to Better A.I. Copyright © 2018 - Cognilytica. All Right Reserved. Get weekly research, insights, analysis, vendor reports, end-user use cases, exclusive event discounts, and other information delivered once a week to your inbox. Sign up to be one of the thousands getting Cognilytica Insights. Are you looking to take your AI & Machine Learning projects to the next level? Or are you looking to take the first dive into a real-world AI project and need to get access to best-in-class AI & ML methodologies and best practices? 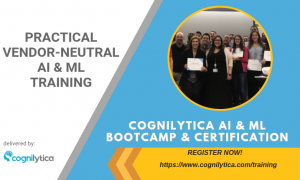 Then sign up for our Cognilytica AI & ML Boot Camp. On-site and open enrollment options. Click here for more details.